Smoking is one of the most emotive issues of our time. It is now well established that smoking is a very serious health risk and it is becoming more and more socially unacceptable. Never forget that nicotine is a very powerful and fast acting drug. It is absorbed rapidly into the blood stream effecting the brain seven to eight seconds after inhalation. In small amounts nicotine generally stimulates nerve impulses, but in large amounts it inhibits them. The body becomes used to having the drug and can react when the supply is cut. The habit becomes so ingrained into the behaviour patterns of the smoker that it becomes almost inconceivable that they can live without it. Smoking becomes part of the self image and as such a part of the personality of the smoker. The most important step is to decide that you truly want to stop and that you no longer want to be controlled by your addiction to tobacco. Once the decision is made, act upon it immediately and do all that you can to reinforce your resolve. What is E.S.P. 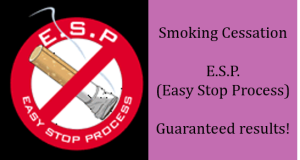 (Easy Stop Process)? E.S.P. was created in 1991 with the aim of making the process of giving up smoking as easy as possible. It has since been developed to what is arguably one of the most effective methods of breaking the smoking habit permanently. E.S.P. is based on the proven technique of hypnotherapy which has had a long association with habit breaking. The process has been enhanced to include motivational tools that reinforce your resolve and help change your self image. In addition every care is taken to address the issues which may have prevented success in the past. My expertise in this field is built on many years experience in dealing with psychological and personal development issues which gives me a unique understanding of the challenges that my clients are facing and allows me to put YOU back in control. The process has been designed as a one session program and in 90% of cases this is sufficient. The session is approximately 90 min. duration for individuals and approximately 135 min. for groups. You will be given an audio cassette as a back up to the session. If you do experience any difficulties within the first 2 months you can return at no extra cost. Your success is my success therefore my on going support is always available. No. There are no drugs or nicotine substitutes used so the only residual effect is a feeling of relaxed confidence. Call+ 44 (0)1403 274 472 now to arrange an appointment at your nearest centre. Private appointments are available throughout Europe by arrangement.